How to recover disappeared messages back to iPhone directly? How to recover disappeared messages back to iPhone directly? Finally, you can retrieve those lost messages to your iPhone directly. Here is the solution for you. Perhaps most people have the same problem: when some messages are disappeared or deleted from iPhone without any backup, usually they will choose to use third party software to recover disappeared messages. However, the problem is you can only recover lost messages from iPhone to your computer. You cannot retrieve them back to your iPhone again. So how to recover disappeared messages back to iPhone directly? iFonebox can do you a favor. Bear in mind that when messages or other data are deleted or disappeared from iPhone, you need to turn on Airplane Mode and then back up your iDevice, just in case of deleted data being overwritten by new added ones. 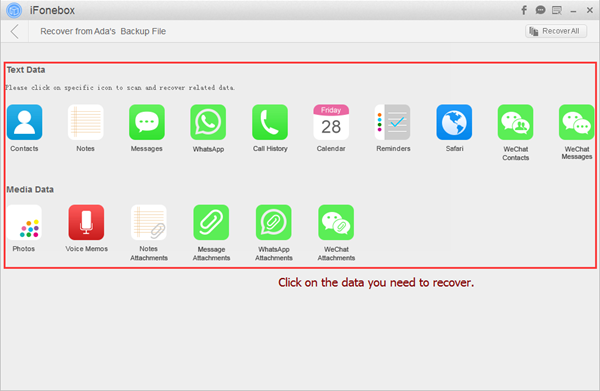 It is known that iFonebox is a professional iPhone and iPad data recovery software which enables you to recover deleted contacts, notes, messages, WeChat data, etc, from iPhone and iPad directly. Plus, it is supportive to extract and restore lost data from iTunes or iCloud backup selectively. One more, with iFonebox, to recover lost messages, contacts and notes back to iPhone or iPad directly is not a problem. So cool that it is worthwhile to be NO.1. 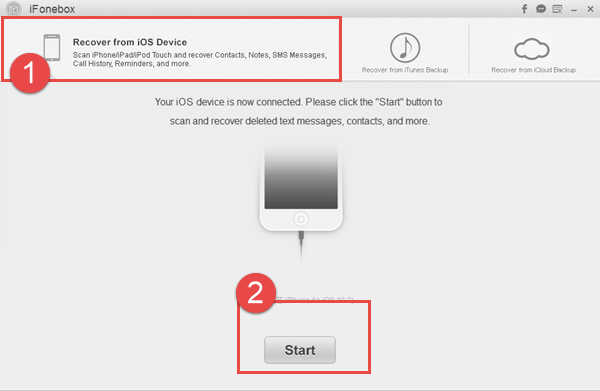 Next, I will show you steps to recover disappeared messages to iPhone directly. Launch iFonebox. Choose Recover from iOS Device mode. Please connect your iPhone to the computer with USB cable. Once connected successfully, your iPhone will be detected by iFonebox. Click Start button to begin. Preview and select messages to recover to iPhone. Now you can select athsoe disappeared messages and then, click Recover to Device button. Once clicked, just follow the reminders pop-up from the software. You need to turn off Find My iPhone in advance. After restoring, your iDevice will be restarted. With an iTunes or iCloud backup for your lost messages, don't panic. 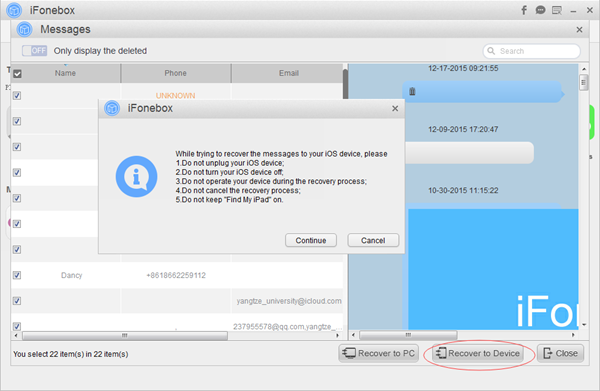 iFonebox will recover disappeared messages back to your iPhone directly. Isn't it convenient and powerful?